Do Professional Fundraisers Work On Commission Only? Home > Ask Our Experts > Do Professional Fundraisers Work On Commission Only? I run a Community Interest Company that specialises in providing music and multimedia interaction, access and therapy for children and young people with Special Educational Needs (SEN) and Emotional / Behavioural Difficulties (EBD). To date we have had a little funding to set up but all of our staff have worked voluntarily which has greatly restricted the amount of people who can access our service. We would like to start paying our staff so we can provide the service full time but for that we obviously need to have the funds! We would like to employ a professional fundraiser but don't have any money to pay them upfront. Do professional fundraisers sometimes work on commission, and if so could you give me a little more information regarding this i.e How you might write this into a funding bid? I heard from someone that this can sometimes be paid for using 'overheads'. First of all, congratulations on your new venture. I am sure many readers are familiar with exactly the problems you have described; in order to raise the necessary funds you frequently need a strong track record, but it is impossible to build on this without full time staff. The good news is that many professional fundraisers work on a commission basis; indeed, most of the ‘chuggers’ who stop you on the street are paid according to the number of donations they solicit. As is explained elsewhere on this site, many fundraisers demand a minimum payment from the charity by which they are contracted; as such, if you choose to take on professional street collectors, you may find that you end up paying out more than you receive in the long-term. This should be at the forefront of your mind when considering fundraising methods. 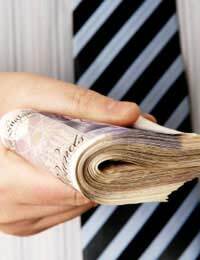 Professional fundraising services can generally be written into a funding bid as an overhead. However, it is important to note that there are other regulations regarding the contracting of professional fundraisers by charities. Primarily, if you predict that the value of the tender is likely to be between £5,000 and £20,000 (whether directly or indirectly; in your case the final amount may be difficult to judge as you are hoping to pay solely by commission) then it need only be advertised locally. However, you should still get at least three quotations from different organisations in order to ensure you are getting the best value for money. On the other hand, if the value of the tender will exceed £20,000 it must be advertised nationally. Finally, if the value is likely to be less than £5,000 you can advertise in any way you see fit. Clearly, it still makes sense to gather a range of quotes in order to ensure your fundraising is as cost effective as possible. You should also note that, while cost is the primary factor for many charities, it is important to distinguish between fundraisers on the basis of the nature of the companies themselves. Remember that these third parties will be representing your charity; it is therefore vital that you are happy that they can paint a good picture. How to Raise Interest in Fundraising Project? Cash Raffles - Are They Legal?